George Avramidis is a Gold Record awarded Composer/Arranger and Sound Engineer, born and raised in Nikea, Greece in 1980. He has gained a degree in classical piano and is also a great electric guitar and drums player. He has studied Industrial Informatics Engineering at the Technological Institute of Piraeus (T.E.I.) and has worked as an embedded systems designer at the R&D and Industrialization Department of INTRACOM S.A., a Greek multi-national Telecom Company. He has arranged and engineered Iosif’s Lemonis debut artistic rock album called “Το αύριο θα μοιάζει με το χθες – (trslt.Tomorrow will be like yesterday)”at the age of 22. Up until now he has composed, arranged, engineered and played musical instruments for various artists,commercials, theatrical plays, and the successful TV series “Ευτυχισμένοι Μαζί (trnsl. Happy Together)” (including the CD soundtrack and the solo CD of Petros Mpousoulopoulos that followed). George Avramidis has also chief engineered the creation of the supplementary audio CDs of the new “Music Book” for the 1st and 2nd grade of Primamy School of Greece, being a special collaborator of the Educational Book Publishing Organization (Οργανισμός Εκδόσεως Διδακτικών Βιβλίων-ΟΕΔΒ). He has also contributed to the music edits of sports meetings of several eurhythmics and aerobics unions, including the Greek Olympic team of Eurhythmics. George is currently being involved into composing, arranging and engineering music for various projects, and is also teaching “Music Technology & Sound Engineering” in the modern department of “Opera” conservatorium in Patisia, Athens. Nikos Papadakis studied Shipping & Transport atLondonMetropolitanUniversity. 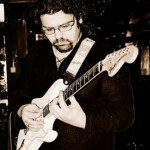 He plays the guitar and has studied drumming with Andreas Niakaris. He started playing music with various groups and contributed in arrangement and writing of several songs. 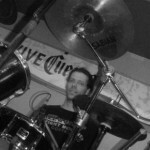 Nowdays Nikos is a professional drummer and session musician. He collaborated with many famous greek singers like Themis Adamantidis, Angela Dimitriou, Katerina Stsanisi, Alekos Zazopoulos, Haris Kostopoulos, Maria Iakovou, and Irini Merkouri amongst others. He is currently working with songwriter and singer Vassilis Dimas.